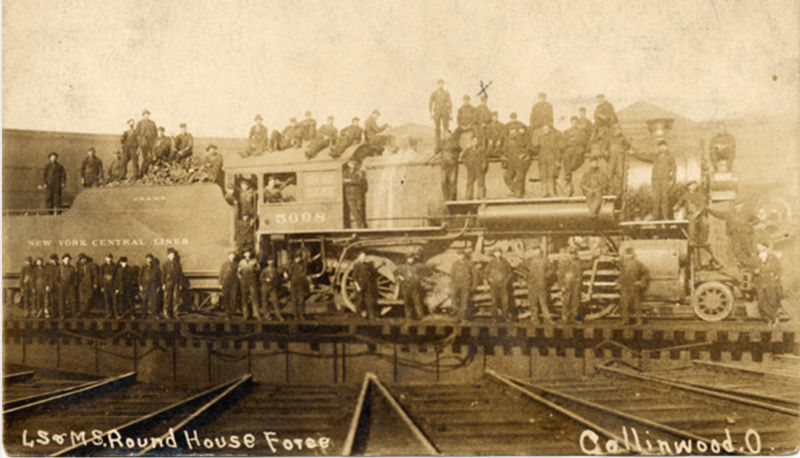 Lake Shore and Michigan Southern Roundhouse Force, Collinwood, Ohio, c1910s. CSU. 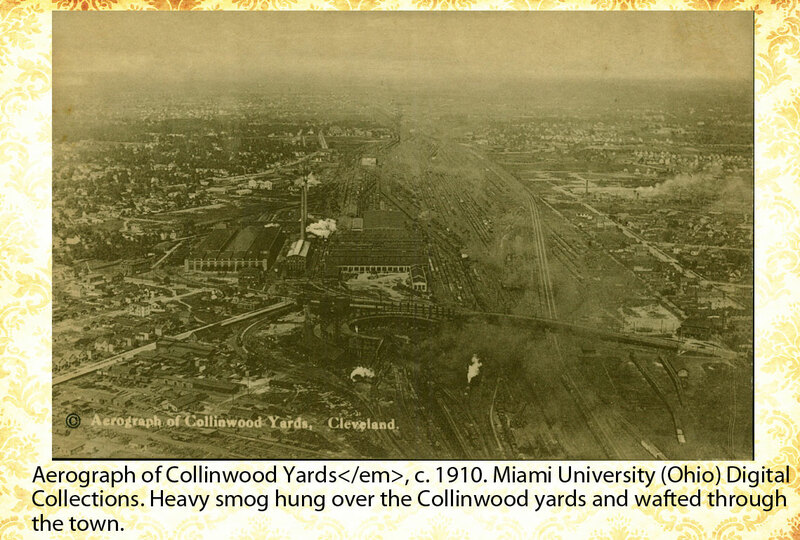 In 1908, Collinwood was, above all else, a railroad town. The enormous trainyards and maintenance shops of the Lake Shore and Michigan Southern Railway shaped daily life and Collinwood was a boom town, and the landscape of industrialization included reckless development, environmental degradation, and cultural conflict.dominated the local economy. Located in a town of 8,000 residents, the railroad facility had 1,400 employees, and almost every other business in Collinwood relied on it. Trains brought raw materials to brick makers, foundries, and steel mills that grew by the tracks and carried finished products away for national distribution. Real estate flourished only insofar as the trainyard brought jobs to town. Railroad employees frequented saloons, restaurants, and retailers. But if the railroad brought prosperity to parts of town, it also led to growing pains–the degradation of air and water, the inability of public services to meet the needs of a larger population, and emerging class and ethnic tensions as immigrant laborers, mostly from Southern and Eastern Europe, joined earlier arrivals from Ireland, Germany, and Scandanavia. In the not too distant past, Collinwood had been a sleepy settlement with vineyards expanding along Lake Erie. In 1908, locomotives idled and clattered in the switching yards all day and night, spewing clouds of black exhaust. Smokestacks from factories added more smog to the pall that hung constantly over town. Water and sewer service failed to keep up with a growing population. 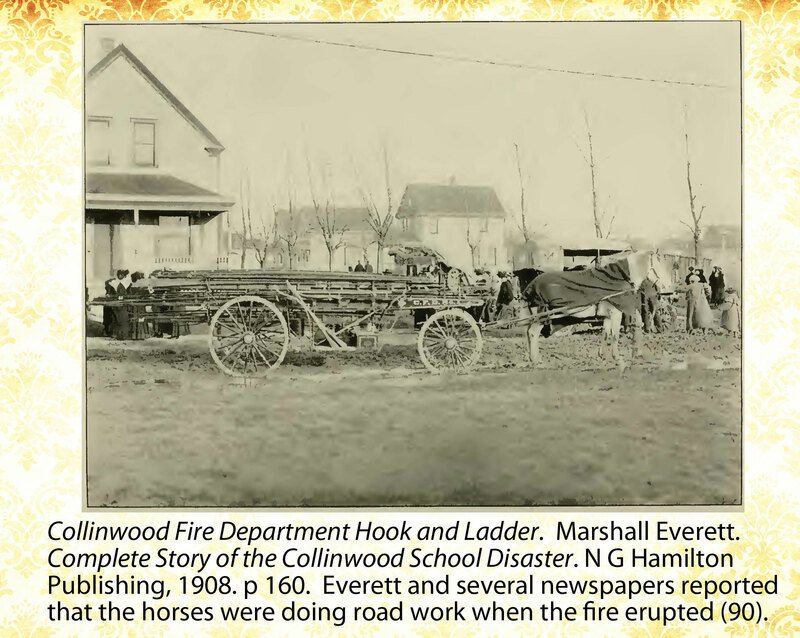 Only outdated, horse-drawn equipment and a volunteer department protected Collinwood from fire, C. B. Lake Cafe. 667 Collamer St. Collinwood, OH, c1913. CSU. Lake worked for the railroad in 1900, but by 1908 he operated this saloon a block or two from the tracks. Many of his customers must have been railway men, including, perhaps, the man to his left. The picture window allowed unobstructed views to the interior, conforming with the town’s regulations. The sign in the lower left is for the Leisy Brewery, one of Cleveland’s biggest. but the municipal horses had several, conflicting duties. When the alarm at the school sounded, a maintenance crew had them hitched to a grader a mile from any fire equipment, smoothing the town’s dirt roads, which became particularly difficult to navigate in the muddy Spring. As Collinwood grew, saloons proliferated. Throughout the country, neighborhood saloons provided food, music, pool tables, alcohol and other amusements to working-class men, most of them immigrants. Exhausted from long days of physical labor, patrons found refuge from the demands of bosses and liberation from family responsibilities. In Chicago, customers referred to their neighborhood saloons as “The Freedom,” “The Social,” and “The Club,” places for men “to shake out their hearts together.” Temperance reformers, on the other hand, saw only a threat to traditional, Protestant, rural, and “American” values. The Anti-Saloon league, the largest organization seeking the prohibition of alcohol in the United Frank Beard, Rescued in Fifty Great Cartoons, Spectrotype Co, 1890. Rescued epitomizes the moral panic over saloons in Collinwood and elsewhere. 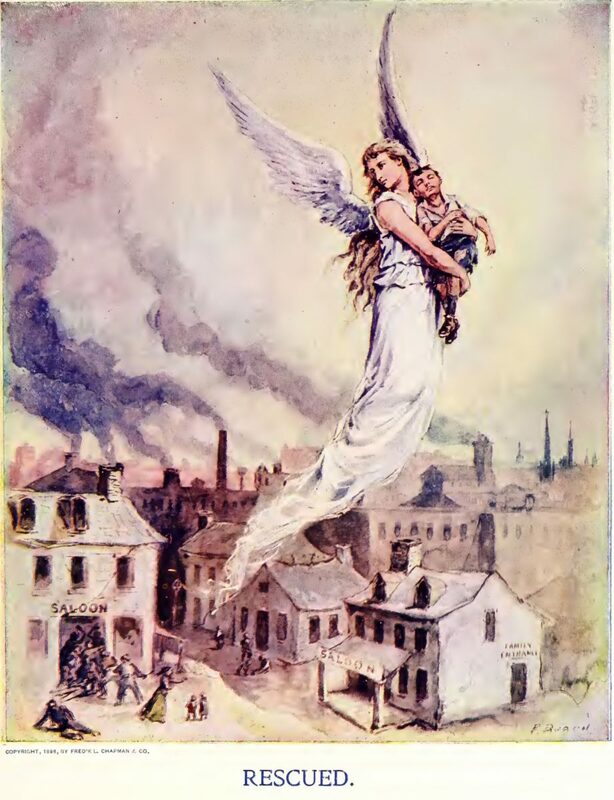 An angel carries a child upward while drunks stumble and fall in a saloon’s doorway. Soot and smog hang over the town. States, complained of foreign vice, debauchery, and public drunkenness in the workmen’s “clubs.” The saloons, they insisted, cultivated sloth, drove otherwise moral young men to dissolution, destroyed families, and led to hungover or simply absent workers. The ready sale of beer and liquor, the anti-saloon league believed, threatened the very fabric of the nation, and members led a national campaign to stop it. In Colllinwood, the Anti-Saloon League, local politicians, and railroad executives campaigned for ballot initiatives to vote the town dry. In 1902, newspapers reported that the Lake Shore Railway pledged one million dollars in increased capital expenditures, if voters passed local prohibition. “Under the conditions that exist in the town [now],” said the railroad superintendent, “we cannot get the . . . skilled help we want.” Railroad managers also played leading roles in organizing Collinwood’s “dry” movement. On the day of the vote, those supporting the saloons complained that the Lake Shore stationed detectives conspicuously throughout the town to monitor and intimidate voters. No doubt influenced The railyard cut Collinwood in half. This 1912 map shows industry lining the tracks. The arrow in the upper left points to the site of the Lake View School in 1908. The town completed construction of the Collinwood Memorial School on an adjacent lot about two years after the fire. 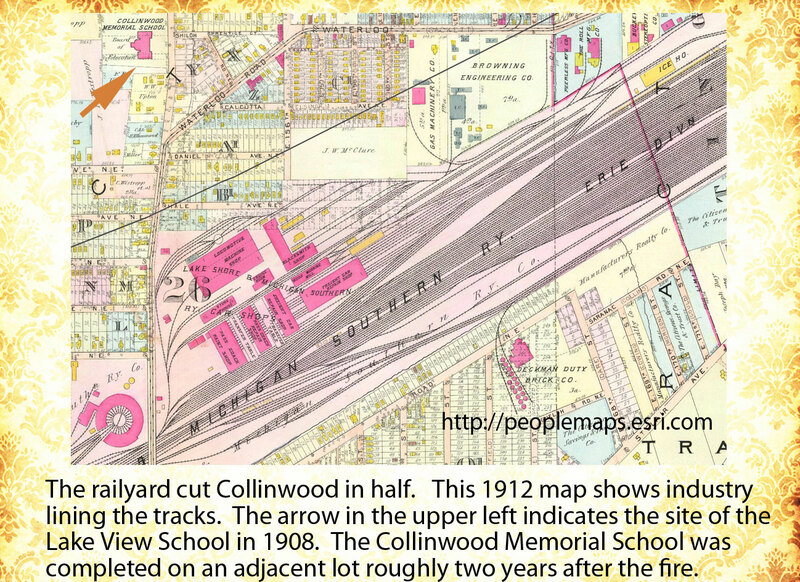 http://peoplemaps.esri.com/cleveland/ by the Railroad, Collinwood voted narrowly to prohibit the sale of alcohol. 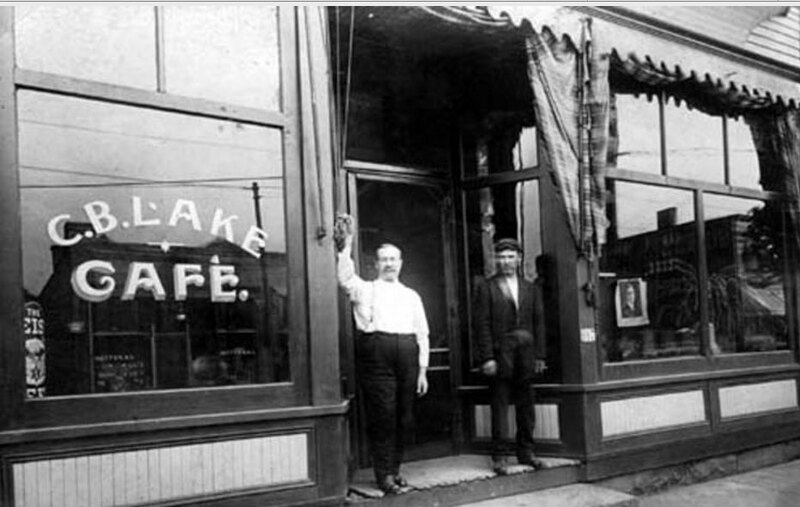 Saloons, though, continued to operate in the shadows and, two years later, a second ballot initiative re-opened them legally. Not to be defeated, town officials turned to strict regulation, prohibiting saloons in 1906 from offering any music (live or recorded), slot machines, or “games of chance.” They required all establishments selling alcohol to be well lit and allow unobstructed views of their interior from the sidewalk. Closing time was no later than 10pm. If the saloons couldn’t be permanently closed, these ordinances seemed to say, they might be made much less enjoyable and more rigorously policed. If immigrant workmen wanted freedom from surveillance and Protestant propriety, authorities in town tried to make sure they couldn’t find it. Collinwood was a boom town, and the landscape of industrialization included reckless development, environmental degradation, and cultural conflict. Native-born residents knew Click to open a visual story of Collinwood’s growth. that immigrant labor powered their town’s economic expansion, but also often found themselves uncomfortable with the Slovenes, Hungarians, Germans and others in their midst. The Collinwood fire erupted not just into a school but into an industrializing suburb of Cleveland that had changed rapidly from a quiet, rural settlement into a manufacturing center and transportation hub with a substantial working-class and immigrant population. The fire found all of its most important meanings in this context.